National Day Rally 2013: But How Much Will The Government Pay? 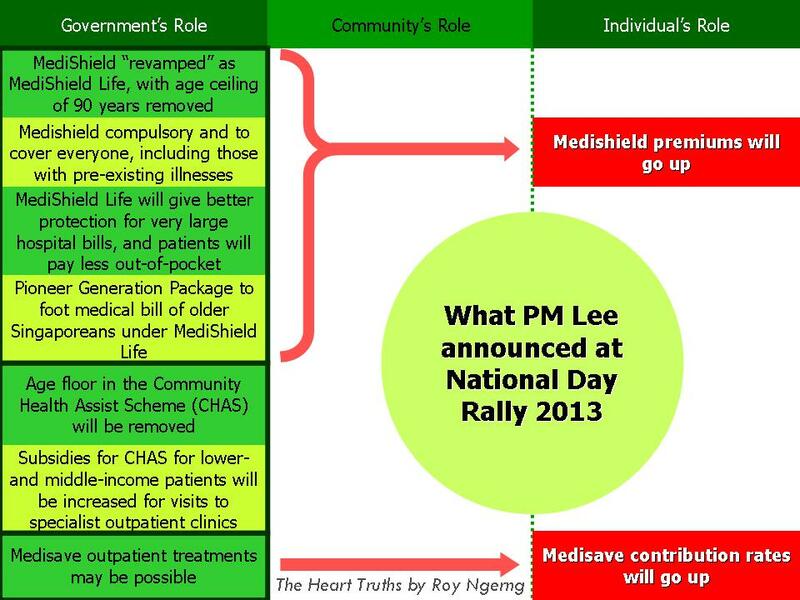 Prime Minister Lee Hsien Loong announced some new healthcare initiatives at the National Day Rally 2013 yesterday. I applaud the government for going in the right direction but I do not think that they are enough. Let me explain why. The current Medisave interest rate is 4%. The government has enough resources to increase this by another one-percentage point, for example, to 5%, at least for the poor and elderly, to help them cope with the rising healthcare costs. The government should provide a higher payout for Medishield, at least for the poor and elderly. The current maximum lifetime claim limit is $300,000 is low. But more importantly, it doesn’t fully cover the person’s health spending as there are restrictions to the usage of Medishield. The person would have to take up additional insurance to cover for the health spending. The government should increase the Medifund coverage and payout. The government dispensed $90 million of Medifund aid to 518,000 applicants in 2011, which means that each application only received $174 on average. This isn’t enough. The government is currently only spending about 4% of the GDP on healthcare. Other developed countries spend an average of 8%. The government is currently spending only about 30% of our health spending. Other countries with the same level of GDP per capita, such as Norway and Japan, spends around 80%, whereas even America spends 48% and South Korea spends 58%. The government had said that it plans to increase the spending to 40% but this would still be the lowest among the developed countries. Currently, the older one gets, the more they have to pay for their Medishield premiums. PM Lee had announced changes to this yesterday. But even so, can the Medishield premiums be made progressive, where the rich pays higher premiums while the poor could then pay lower premiums? There should be a more streamlined process for applying for Medifund so that it would be easier for the poor to access additional financial assistance. The government should increase the wages of Singaporeans because our wages have remained stagnant, and for the lower-income earners, their real incomes have actually dropped. With inflation and healthcare costs that have been rising fastest than incomes, the government would need to increase incomes to allow Singaporeans to continue to be able to afford healthcare. Now, let’s compare this to what was announced by PM Lee at the National Day Rally 2013 yesterday. Chart 2 shows you what was announced. First, I have to applaud the government for expanding Medishield to cover everyone, extend CHAS to everyone in low-income households and to explore letting Medisave be used for outpatient treatments as well. These are welcomed moves which would allow those who had fallen through the cracks to be reached. However, in comparison to what I had advocated needs to be done for healthcare in Singapore, there is still much that needs to be done (Chart 3). 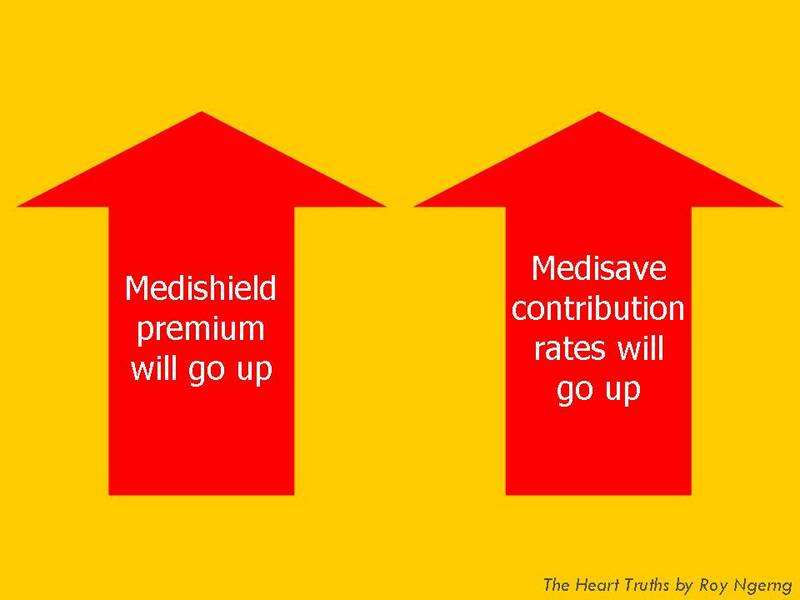 The government still has not increased the interest rate for Medisave, but had instead said that Medisave contribution rates will increase – so we will increase our contribution, but what about the government? Will Medishield payout increase? Even then, this will come with us paying higher premiums – again, we will increase our contribution, but what about the government? There was no announcement on Medifund to increase the coverage and payout. With these initiatives, will the government’s expenditure, as a proportion of GDP, increase? With these initiatives, will the government’s expenditure, as a proportion of health spending, increase? The government did not announce if the Medishield premium payment will be made more progressive. The government did not announce if the Medifund application process will be simplified. The government will not be increasing wages (again). Also, are the changes to Medishield enough (Chart 4)? 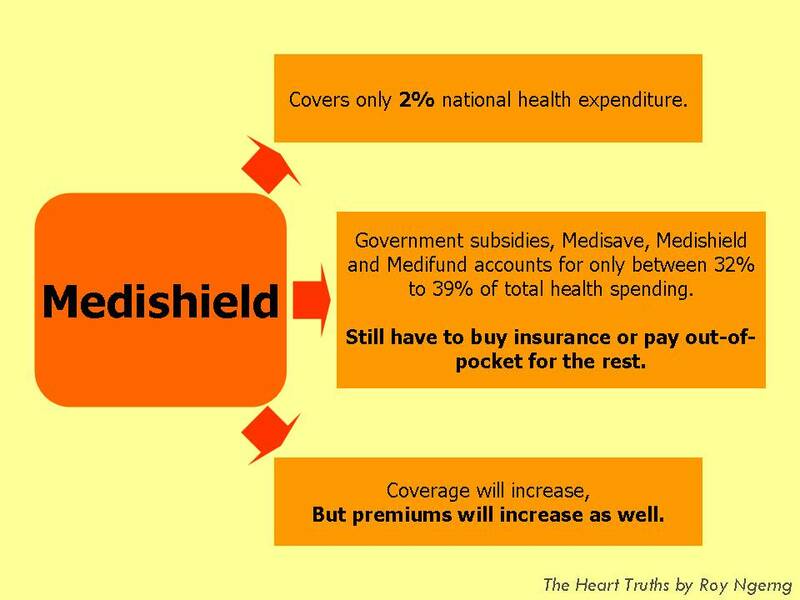 Right now, Medishield only covers for 2% of the total health spending in 2011! With the changes, how much will it cover? 3%? Even then, we are paying so much into Medishield but receiving so little back! Also, the government subsidies, Medisave, Medishield and Medifund accounts for only between 32% to 39% of total health spending from 2002 to 2011. We would still have to buy insurance or pay out-of-pocket for the rest of the more than 60% of our health spending! The Medishield coverage might increase but the premiums will be going up as well! Also, the last time Medishield premiums were raised were actually in July last year. I had also written then that premiums were increased, but the claim per premium actually dropped, which means that we were paying more but getting lesser in return! Will a similar situation happen again with these changes? 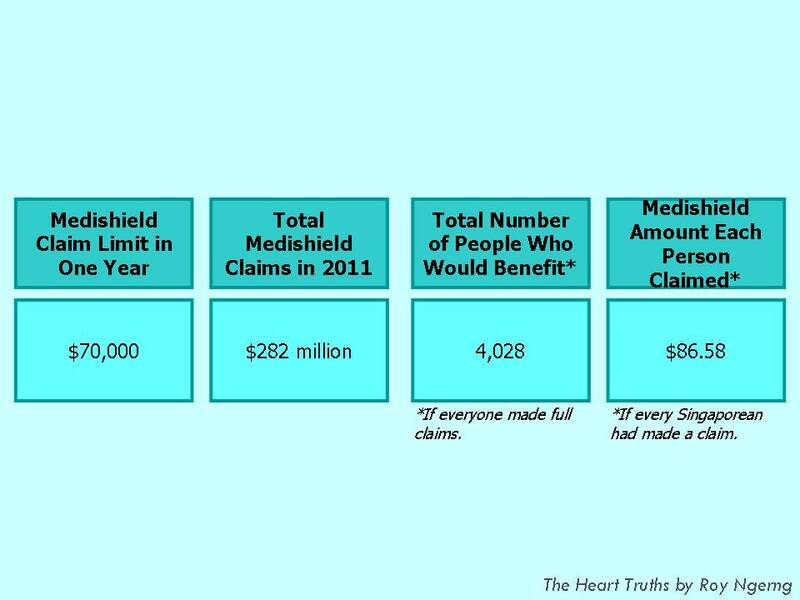 The Medishield lifetime claim limit in one year is $70,000 but then, only $282 million was used in 2011. This means that only 4,000 people would have benefited, if they had used all $70,000. 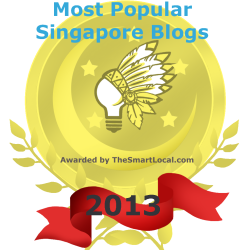 Or to look in another way, there were 3,257,000 Singapore citizens in Singapore in 2011. If everyone were to have used their Medishield, this would mean that each person would have used only $86.58. This begs the question – how many people actually benefitted from Medishield, and how much were their exact claims? How much can, or do people actually use from their Medishield, even if the lifetime claim is $300,000? (Note: I had incorrectly used the calculation of the Medisave contributions as the computation for the Medishield premium. I would like to thank readers for pointing this mistake out.) For a person who earns a starting pay of $2,000, they might put in about $150,000 in premiums by the time their retire at 65 (Chart 6). For a person who earns $3,000, this might be $200,000. And for a person who earns $4,000, this might be $300,000. But how many of us will even come anywhere close towards spending the amount of money, or even half of what we put into our premiums? In response to the questions above on whether the government will increase their expenditure, I doubt that the government will do so. 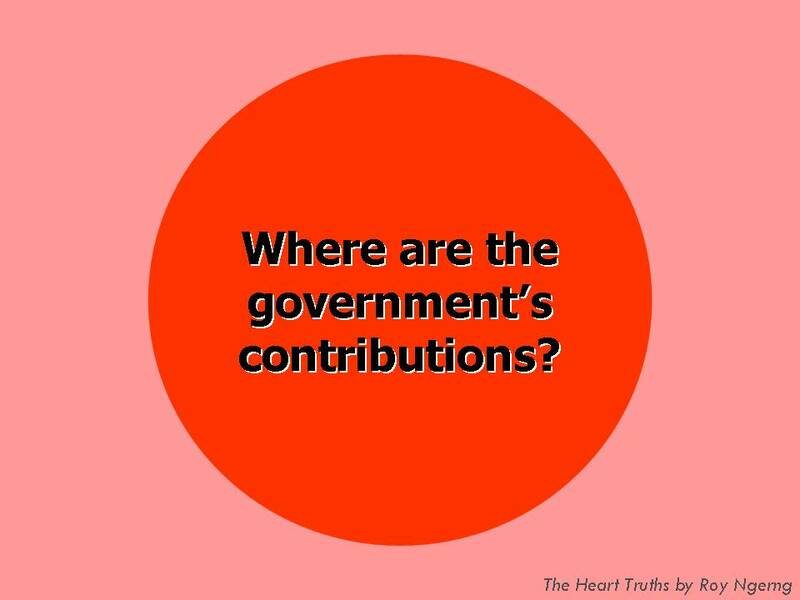 But my question is – where are the government’s contributions? Singapore has at least $800 billion in reserves. The GIC and Temasek Holdings are ranked the 8th and 10th largest and richest sovereign wealth funds in the world. Singapore has the highest reserves per capita in the world. This is not forgetting that Singapore is the richest country in the world, by GDP per capita. Our wages have remained stagnant and for the poor, their real wages have dropped since 2000. 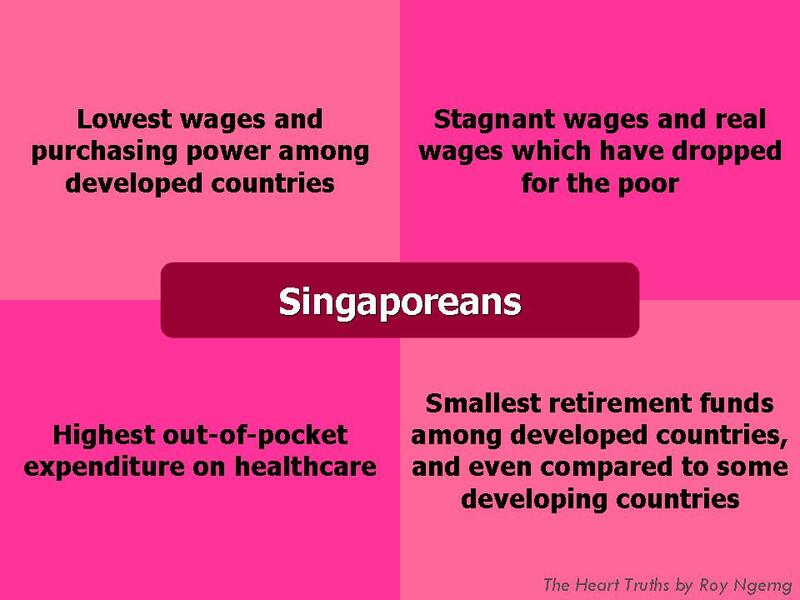 Singaporeans also pay the highest out-of-pocket expenditure on their health spending among the developed countries. Singaporeans also have the smallest retirement funds as compared to the developed countries, and also compared to some developing countries. 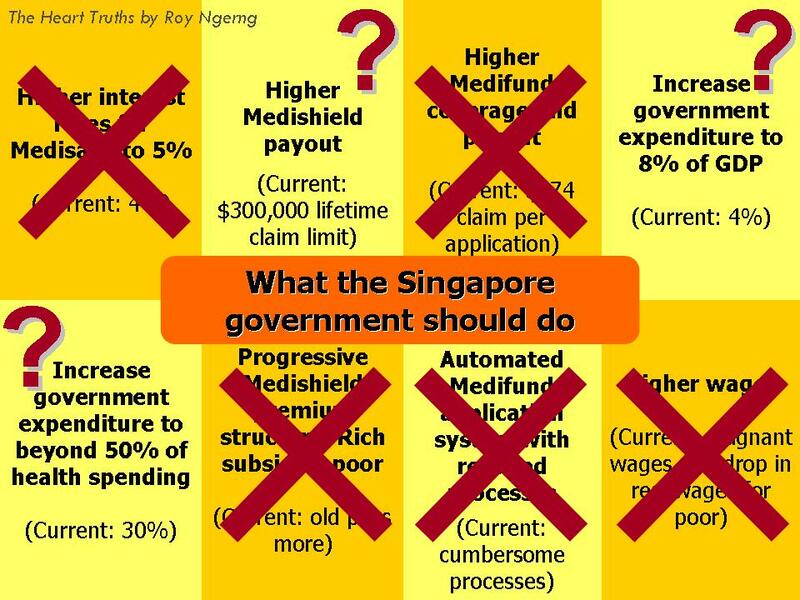 Looking at Chart 9 and 10, do you think the government can do more first, before Singaporeans are made to pay more? CHAS will be extended to everyone in low-income households. I am glad to know that there are people who aren’t now covered under the healthcare system in Singapore at all, but Medishield will be expanded to cover for them. It is good that the government will roll out the Pioneer Generation Package to help pay for the medical bills of older Singaporeans. This is late, but at least the government knows now that there is also financial burden on people’s outpatient treatments and Medisave is being considered to be expanded to include outpatient treatments. But these are tweaks. Looking broadly, how will the poor and elderly still be able to pay for the more than 60% of their health spending? They would still need to buy insurance or pay out-of-pocket – but question is, will they have enough to spare? Sure, CHAS will be extended for everyone in low-income households, but it is a partial subsidy and covers only for certain illnesses. Medishield might be expanded in scope, but how much would the poor and elderly still need to pay out-of-pocket? The Pioneer Generation Package might help pay for the medical bills of older Singaporeans, but again, how much more do they need to pay for their own pockets? The Pioneer Generation Package might cover older Singaporeans from the “pioneer generation”, but what about older Singaporeans who do not belong to the “pioneer generation” or future generations of older Singaporeans? – why did they create the term “pioneer generation” so that these initiatives will stop with the “pioneer generation”? Medisave might be expanded for outpatient treatments, but how much more would the poor and elderly have to pay from their own pockets, again? And we are not talking about small amounts here. We are talking about more than 60% of health spending that individuals have to pay out of pocket for. My point is this – what PM Lee had announced are tweaks. The initiatives aren’t major overhaul to the system to protect the poor and elderly. And as I had mentioned in Chart 9, the government can do more to give more protection and security to the poor and elderly in Singapore because Singapore has the resources to do so. Make no mistake, what was announced is a step in the right direction, but is it enough? Is it too piecemeal? If you look at Chart 11, you can see that in Sweden, for a high-income earner who pays 56.6% tax, he/she receives 100% full universal healthcare coverage, among other things. 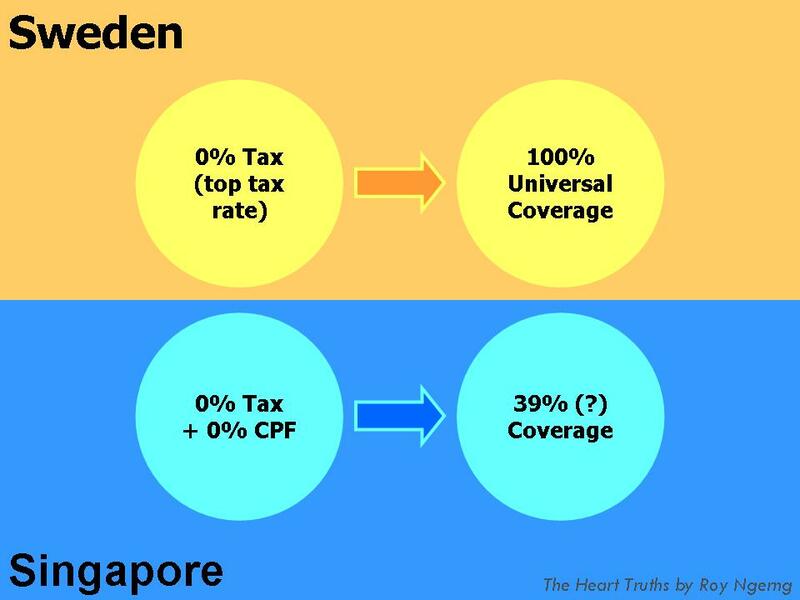 But in Singapore, a high-income earner who pays 20% tax and 20% CPF will receive only 39% healthcare coverage in 2011. 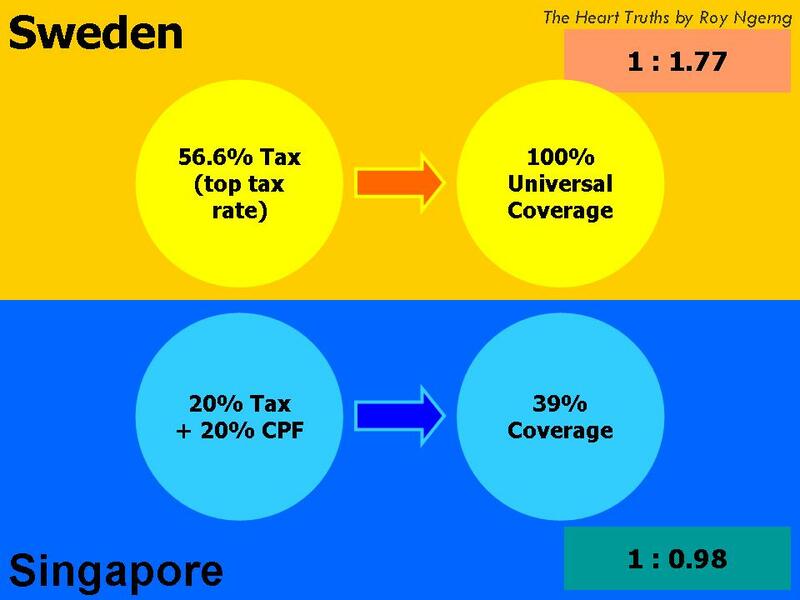 What the person receives in return per tax dollar in Sweden is much higher than in Singapore. Why is it the same person in Sweden can receive so much more, for the same amount? What’s with how their government computes benefits and payments back for the Swedes in more parity than it is for Singaporeans? And if you look at Chart 12, for a low-income earner in Sweden who pays 0% tax, he/she still gets 100% full universal healthcare coverage. But for a low-income earner in Singapore, the person might not need to pay tax or CPF (if he/she earns below $500), but what would his/her healthcare coverage be? Will it be 39% or will it be lower? How would the person be able to pay for the other 61% of his/her health spending? In Sweden, the low-income earner will be taken care of, but in Singapore, the person would still have to live in fear. 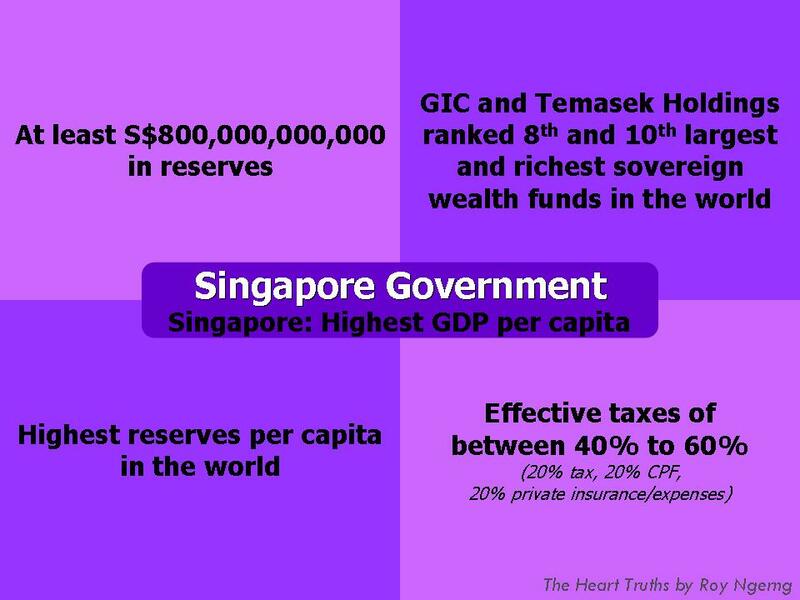 But why, when Singapore’s GDP per capita is higher than Sweden, when our reserves are higher, reserves per capita are higher, and when the people pay just as much effective tax? This is why I think the government can do more. 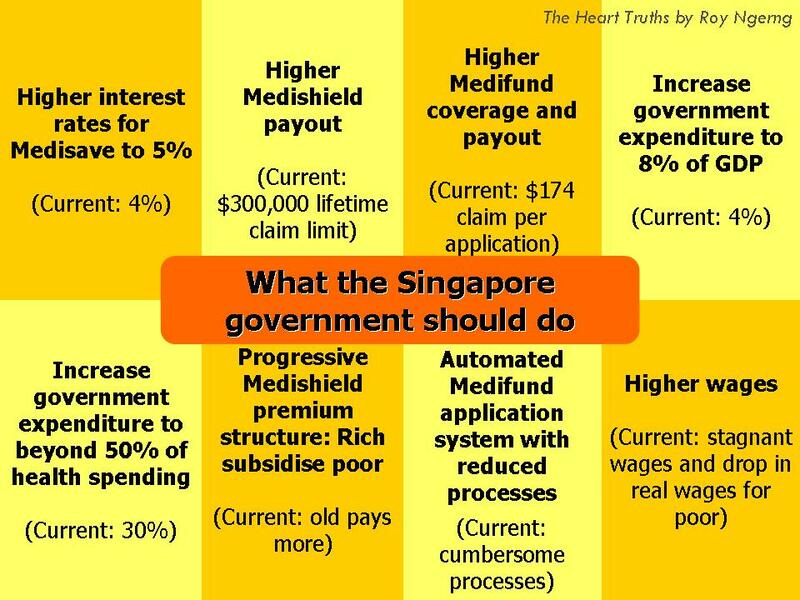 At last night’s announcement, PM Lee announced that Singaporeans would have to pay higher Medishield premiums and Medisave contribution rates. I am aware of the need to back up your articles with statistics and charts. It is necessary. I am a simple man. I have to be self reliant and self sufficient. This NDR speech only confirms once again : That, it is giving now with one hand, to be taken back later by the other. That, it gives a warning that it is still not listening and sneakily moving towards 6.9. That, it has aggressively been planning for 2016 by freeing up Paya Lebar. That, I still have to pay Medishield from the interest gained in my Medisave and Retirement account. That, HDB grants given will be channeled back to the Reserves. I am very sad that this is the case. LHL must step down. He is not fit to lead Singapore. It would be clearer if you could do a comparison between Singapore and SAR Hong Kong.As we know Hong Kong does not have GST but have a minimum wage and a lower tax rate(corporate & income) than Singapore. As an SAR, Hong Kong does not have a defence force($12B saved) but it includes Land Sales as part of government revenue whereas Singapore, the land sales are untouchables, go straight into the reserves.Perhaps we can learn something from Hong Kong health services.It seems to me the citizens are squeezed and paying for defence,health services and housing while the government is accumulating surpluses and reserves. Are Taxes In Singapore Really Low? 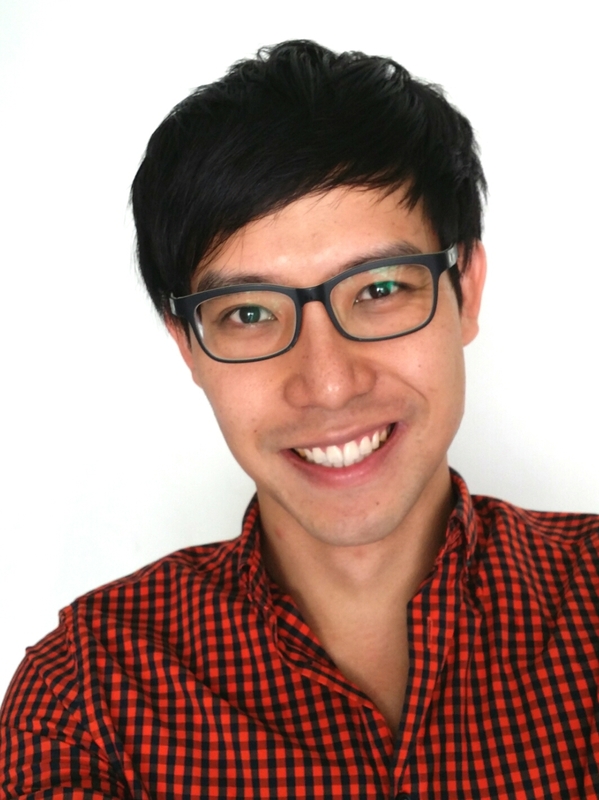 Are Singaporeans More Ambitious To Want Higher Pay?